Had this posted on our Facebook Page… it’s from the South Fayette Shop n Save. So how fresh is FRESH? 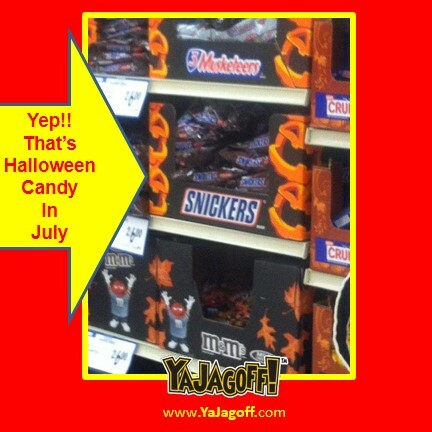 And, what in theeeeeeeeeeeee hell do they make Snickers and m & m candies out of that they can be available in July for Halloween and then able to sit for 6-7 months AFTER Halloween under our car-seats and in the We-didn’t-get-rid-of-all-of-our-Halloween-Candy candy bowl at work! left-over candy dish? Hey South Fayette Shop n Save Managers, do you all have your Christmas shopping done too? Now TECHNICALLY this isn’t really a “Jagoff Move,” or at least at the level of most of our blog posts….but what are we DOING HERE??? Do you guys want my left-over Candy Corns that are strewn all around in my cupboard and junk draw so that you can sell those too, Ya Jagoffs? Thanks to Audrey Joyce for being our Honorary Jagoff Catcher today!